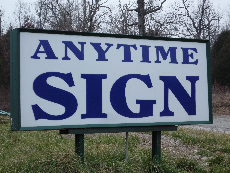 Anytime Sign is a family owned and operated business. We can guarantee our products are printed with using screen printing. We screen print on the best quality materials using solvent inks for the longest outdoor life. All of our reflective products are screen printed on 3M brand materials using 3M brand inks, the only printing processes guaranteed by 3M. We screen print our aluminum signs with a solvent ink that is baked at 400 degrees, the ink manufacturer says that it is five times more durable than the best quality enamel. It can't be scratched off or damaged by solvents like alcohol or gasoline. We take great pride in offering the best quality screen printed products and we hold the highest of standards. Why go with Solvent Screen Printing? 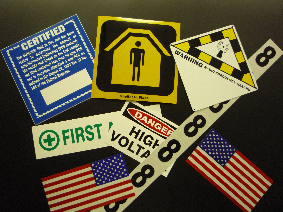 Nothing we manufacture is mass produced using unmanned automation; each sign or decal is handled and inspected for quality before shipping. The infrared patches we sell are manufactured in our factory here in Mammoth Spring Arkansas. Every step of the process is done here at Anytime Sign, artwork, screen printing and die cutting. 3M Brand SOLAS (Safety Of Life At Sea) is approved by the U.S. Coast Guard as a retroreflective material used to enhance visibility of life saving equipment in nighttime, or low light conditions. 3M brand SOLAS reflects brightly when viewed with night vision equipment providing crystal-clear friend or foe identification. Velcro brand Velcro. The Velcro we use has the highest quality acrylic-based adhesive glue and is able to withstand extremely hot climates. Velcro Brand 330 PSA 0172. Solvent Based Inks. All the inks we use on our patches are Solvent Based. Solvent based inks are better than digitally printed or UV in because they adhere better and have a thicker ink deposit. Solvent based inks will not fade, even if they are left outdoors for years. Magic Black Infrared Ink. Magic Black is made and developed by Anytime Sign. We regulate the quality and thickness for ultimate opacity in the visible spectrum. In the infrared spectrum Magic Black becomes transparent allowing for the 3M SOLAS to reflect light back to Night Vision equipment, providing crystal-clear friend or foe identification. Polyurethane Top Coat. 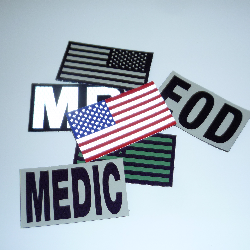 Patches come with a standard Matt top coat to cut down on possible glare in the visible spectrum. The matt top coat is screen printed durable Polyurethane. In addition to cutting down glare the Polyurethane top coat provides protection against scratching, and prolongs the life of your patches (which take a lot of abuse). Why is Solvent Screen Printing better? Solvent Screen Printing is the absolute best printing process. It has much thicker ink, much better opacity, much stronger bonding and much longer life, than other processes. Other processes, Digital printing, Flexography and UV ink screen printing may be cheaper and take less time, but faster and cheaper are not always best. Other processes may look like quality signs and decals, but they will not last nearly as well outdoors. Digitally printed, Flexography and UV ink screen printed signs and decals have an extremely thin coat of ink ( part of the printing processes) and will fade faster when in contact with the elements outdoors. Let's face it when you have to replace your signs and decals every three years or less, saving pennies on inferior printing processes is just not worth it. Get much more out of your signs and decals, go with Solvent Screen Printing; it is the longest lasting out door printing process available.